Everyone promises great customer service and to really care about their policyholders, but our proof is in our actions…see how your fellow NTCA members, who are policyholders, responded to the fill-in-the-blank of "no one has ever ________ for us the way Telcom Insurance Group has". If you're part of our family, thanks. If you haven't yet joined our family, it's time. 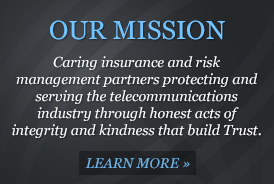 Contact us at TIG@telcominsgrp.com to find out how. Protecting the income producing assets and operations is more important than ever before. Look at the many solutions that we offer. Even though you are in the same industry, every customer has unique needs. Therefore, a specific risk management plan is best developed individually with each policyholder. NTCA owned and directed business insurance and risk management arm for rural telecommunication companies and service and product providers. There are many options to report claims to your carriers. These include: online, calling, or faxing. See the specifics are relates to your carrier.